The Hamilton Beach 49983 2-Way FlexBrew Coffemaker is an exceptional coffeemaker that contains virtually all coffee brewing options in a single coffeemaker. With this coffeemaker, there is flexibility to brewing the needed quantity and it is possible to make any amount of coffee needed ranging from a single cup to even a 12 cup pot. This offers the versatility needed for virtually any occasion. This coffeemaker is also compatible with K-cup packs. However, it has some problems when being used with some k-cup brands. Pods that filter at the bottom and have k-cup tops yield half cup coffee and release steam or hot water when the pod is being removed. The coffee maker also allows brewing of up to 14 oz ground coffee and allows adjustment to fitting a shorter cup. 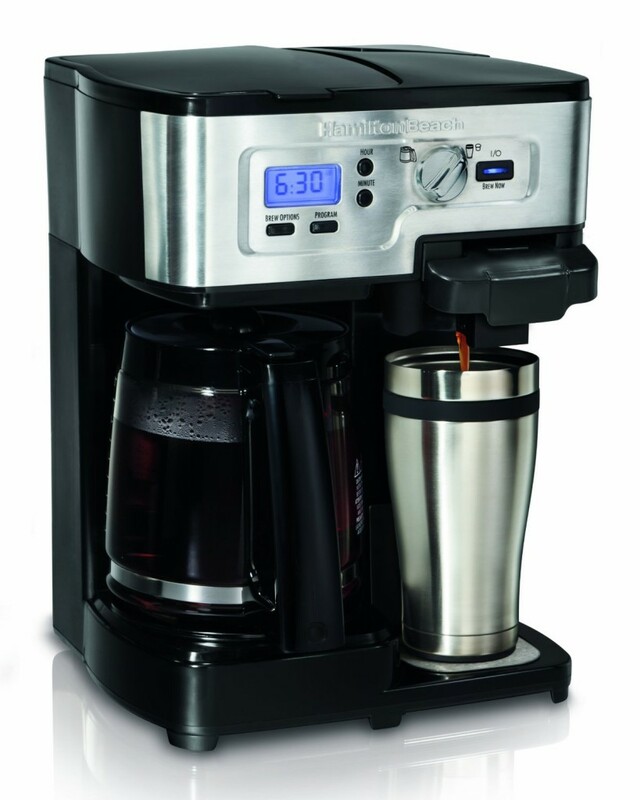 The Hamilton Beach 49983 2-Way FlexBrew Coffemaker has the automatic pause and serve functionality and it also has a two hour shutoff programmable timer. This two way coffeemaker also contains a 12 cup carafe which allows brewing of a 12 cup pot at once for a larger serving. When using the coffee maker’s single cup side, the large pot’s heater also comes on. Using a K-cup, an eight ounce coffee cup can be brewed by the single serving side in 2.5 minutes. The carafe side can be programed in advance up to 24 hours and it has a 2 hour auto shut off functionality with regular strength brew settings. Besides its great look in the kitchen, the Hamilton Beach 49983 FlexBrew coffeemaker provides the required functionality for specific desires. To enjoy a cup by cup serving of coffee, the full pot 12 cup option brewed in the carafe is the best. However, whichever way of brewing used yields a great tasting coffee whenever it is needed. The Hamilton Beach 49983 FlexBrew Coffeemaker comes with a basket that takes cupcake styled filters for the ground coffee. A tray that is used to make individual servings also comes along this coffeemaker and it has two inserts. One is used for coffee pods (ground coffee) while the other insert is used for the k-cup packs. This coffee maker does not have a battery and it depends fully on the AC power for operation. It comes in a primary color of black. In case of clogging of the pod, removal of the k-cup holder should be done carefully because the hot water that has been backed up gets released to the k-cup hence entering the k-cup and washing the coffee grounds down to the coffee cup. This coffeemaker measures 10.2 inches by 10.6 inches by 13.9 inches. Its total weight is 6.4 pounds and its shipping weight is 10 pounds. A disadvantage of this coffeemaker is that it is only possible to brew with either the single side or the full pot. It is not possible to use both sides simultaneously. A single cup can only hold a maximum of 10 ounces of water and this is used as a safety precaution.